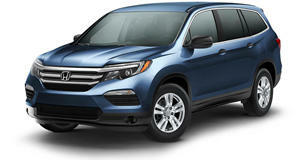 The 2018 Pilot is available in five trim lines, all powered by a 3.5-liter V6 engine developing 280 horsepower, with front-wheel drive standard on all but the Elite, which gets all-wheel drive. The same is optional on all lower trims. A six-speed automatic is standard, while the Touring and Elite models feature a nine-speed automatic. The LX is equipped simply, with air conditioning, a rearview camera, and a five-inch color infotainment display without smartphone integration. The latter is added on the EX trim, along with an eight-inch infotainment system, automatic headlights, Honda LaneWatch blind-spot camera, a power driver’s seat, and three-zone climate control. The EX also adds an Intelligent Traction Management system for both drivetrains. The EX-L builds on this but adds a sunroof, leather upholstery, heated front seats, a power tailgate, and one-touch slide-and-fold second-row seating. The Touring becomes more luxurious still, with standard navigation and rear seat entertainment, but also adds Honda Sensing safety features - all of which are optional on the EX-L. The Touring also gets 20-inch alloy wheels, front-and-rear park sensors, driver-seat memory, and is the first model to get the nine-speed automatic gearbox. The Elite tops the range with a panoramic sunroof, second-row heated captain’s chairs, LED headlights, full blind spot monitoring, and ventilated front seats.